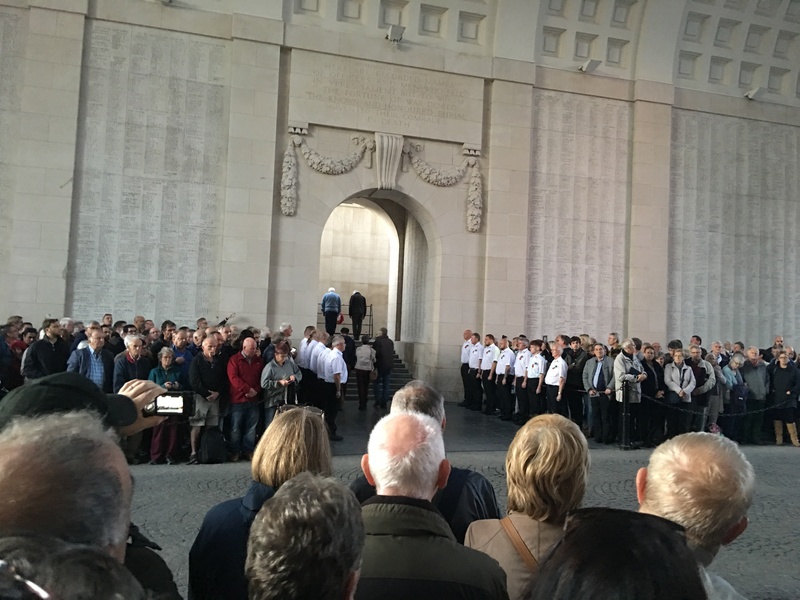 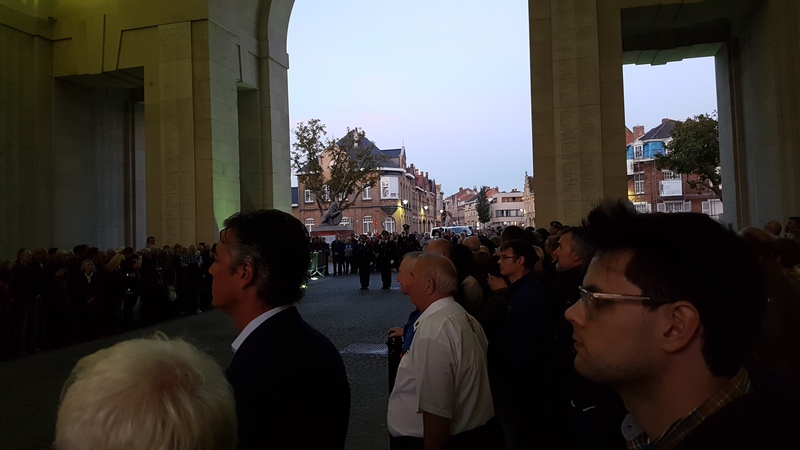 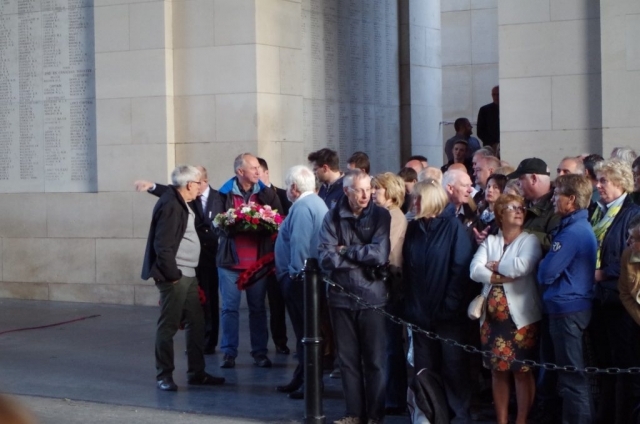 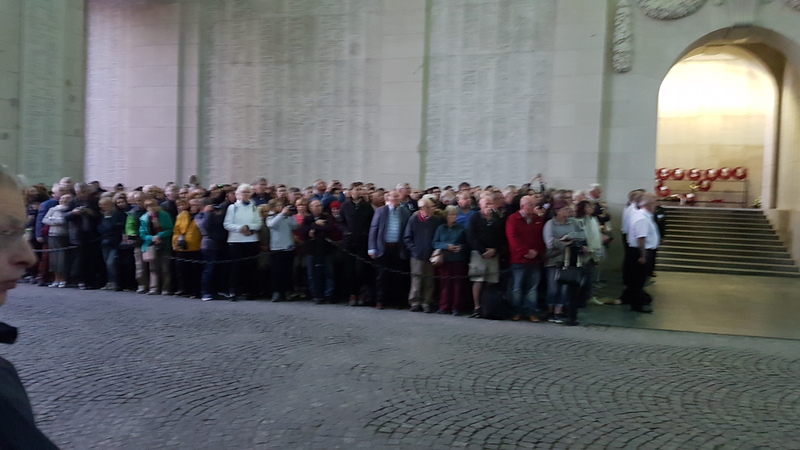 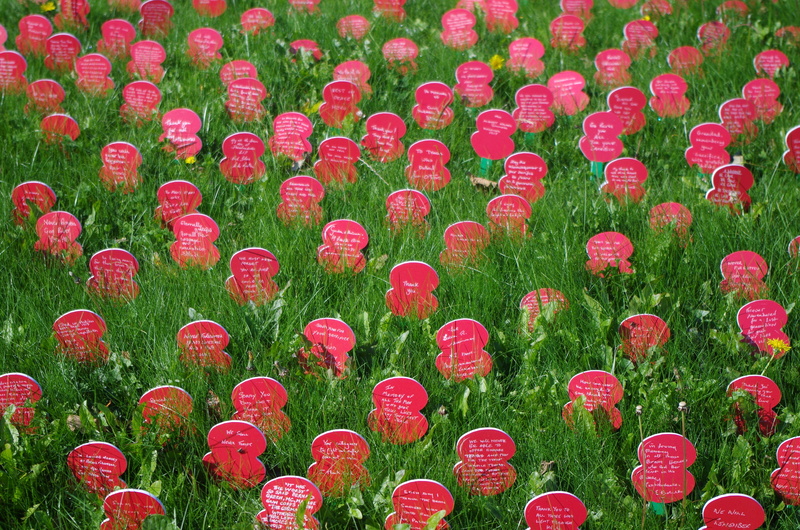 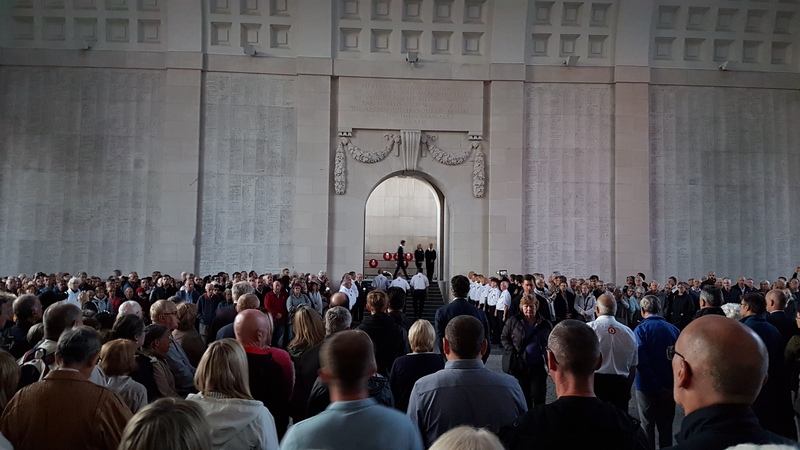 Sunday, 17 September 2017, a group of 40 from both the Oxford and Cambridge Societies and their guests went on a trip to Flanders Fields. 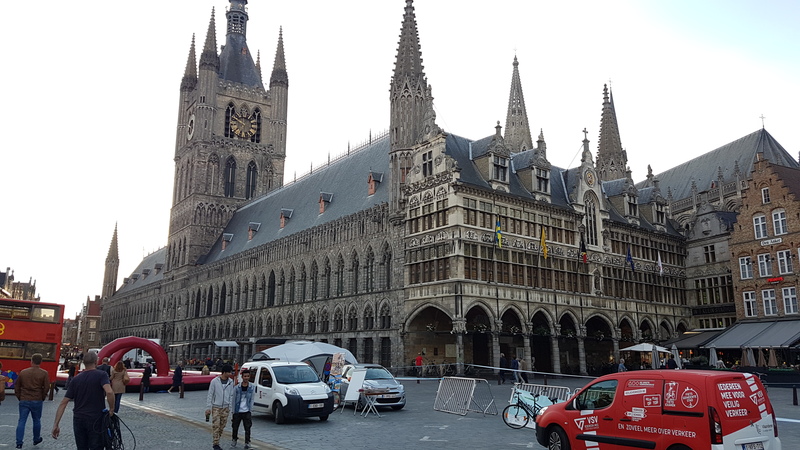 After departing from the Central Station of Brussels we arrived in the Ypres salient in glorious sunny weather. 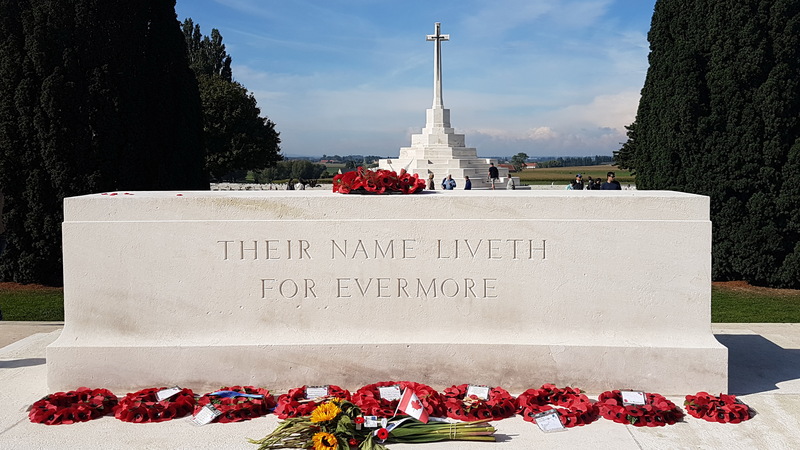 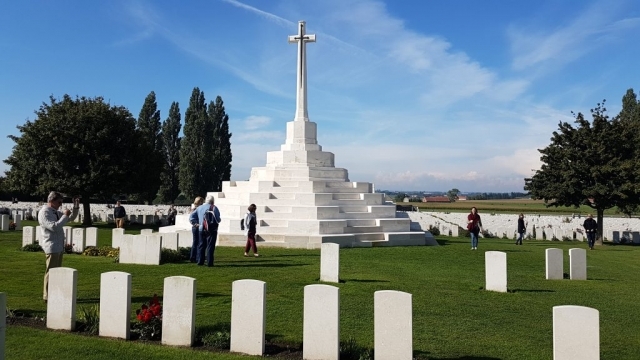 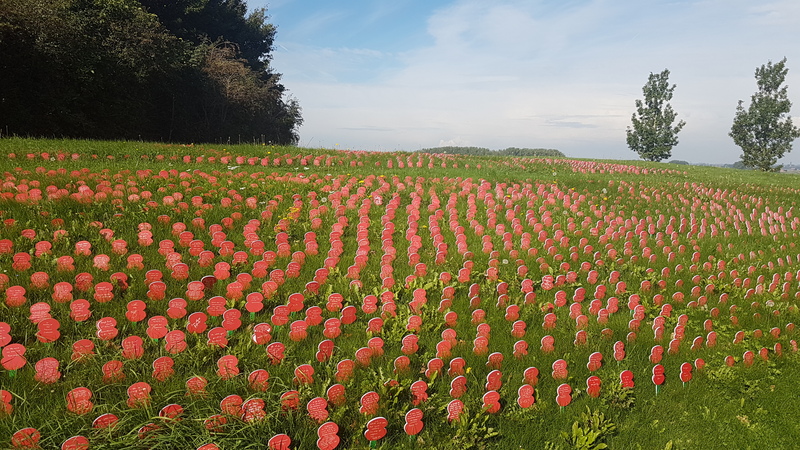 Our first stop was at the Tyne Cot Memorial in Passchendaele located on what once was the scene of the so-called Third Battle for Ypres, fought between July and November 1917, by the British and Canadian forces, better known as the Battle of Passchendaele. The great loss of life to capture a small stretch of land that was retaken by the Germans shortly afterwards provoked thoughts about what the troops would think about the future of Britain’s empire and its position in Europe then and now. 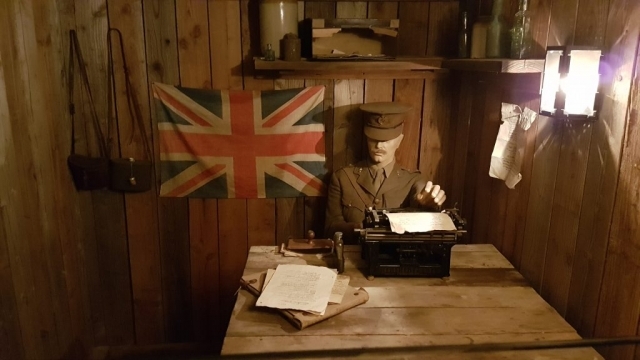 Interestingly the then Prime Minister David Lloyd George disapproved of the final battle plan, only allowing it to happen because there were no other credible ideas at the time and refusing later on to send General Haig fresh troops from England. 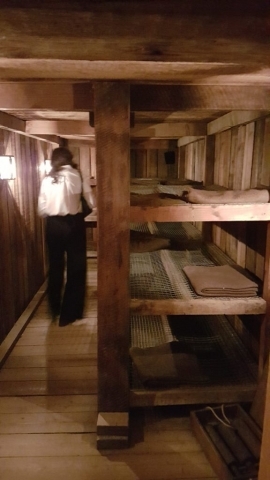 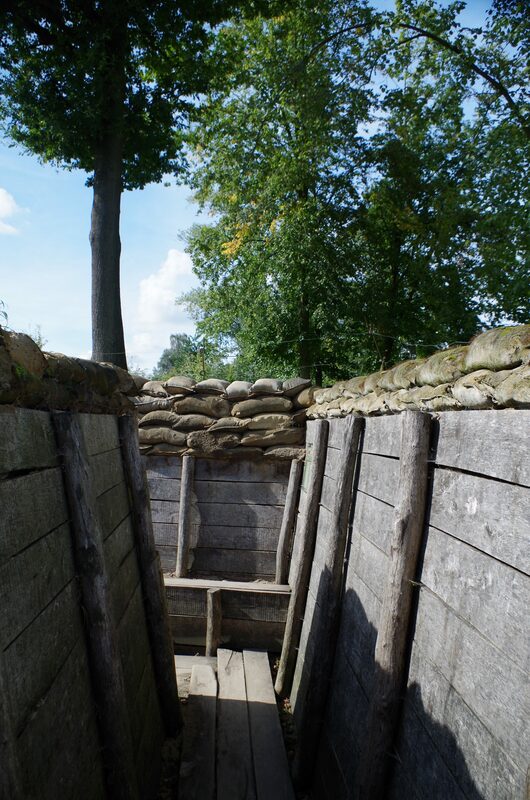 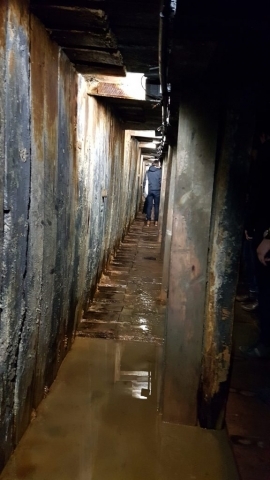 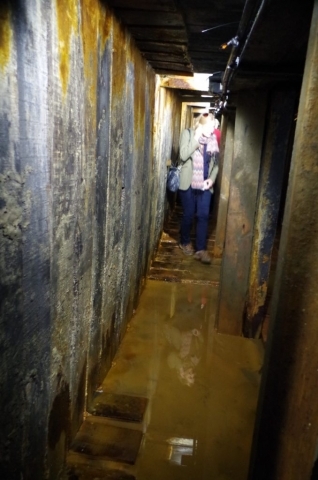 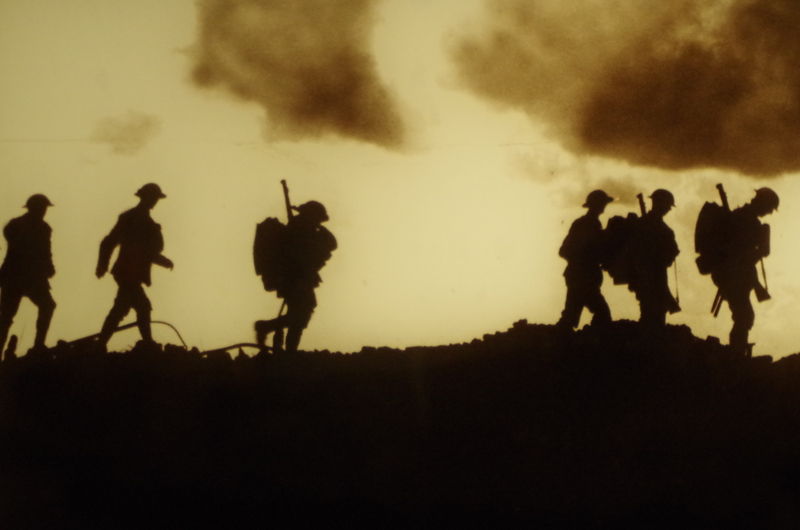 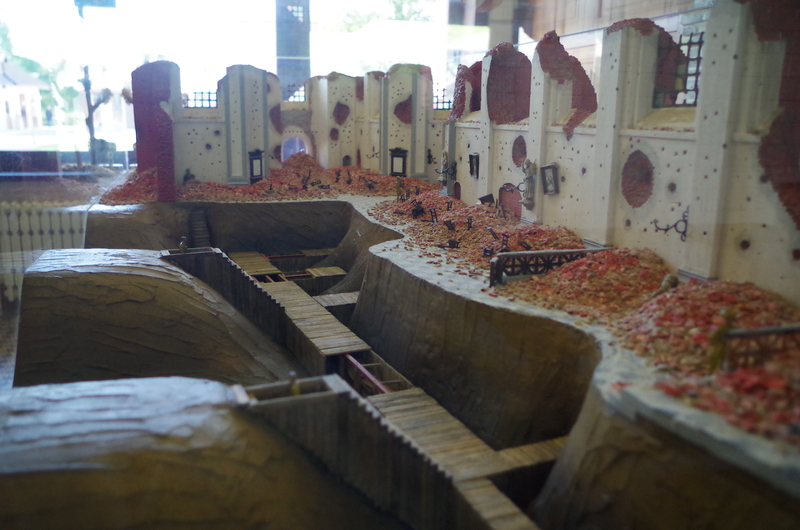 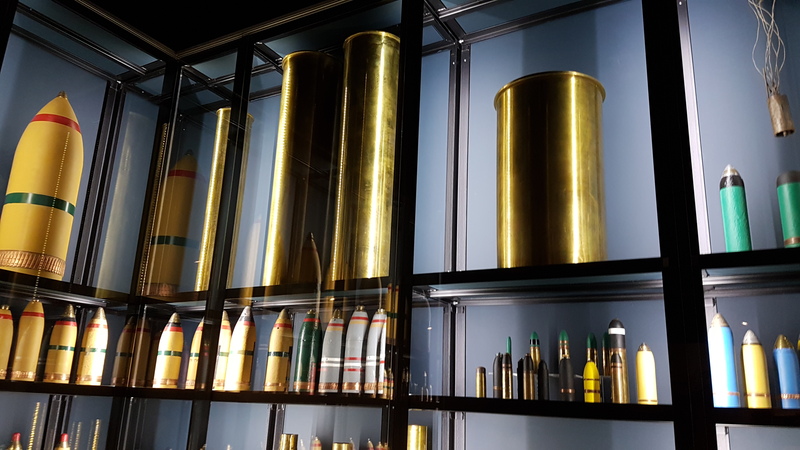 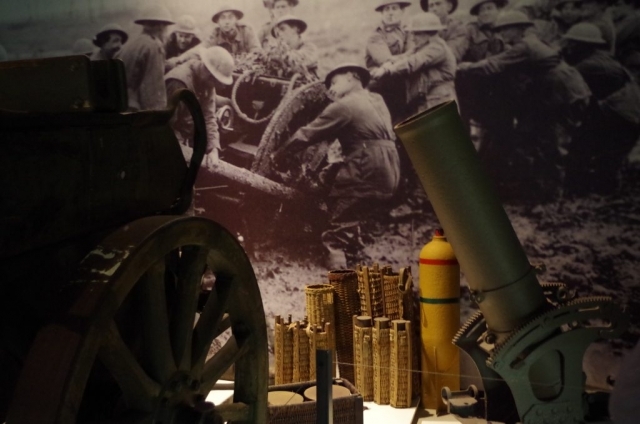 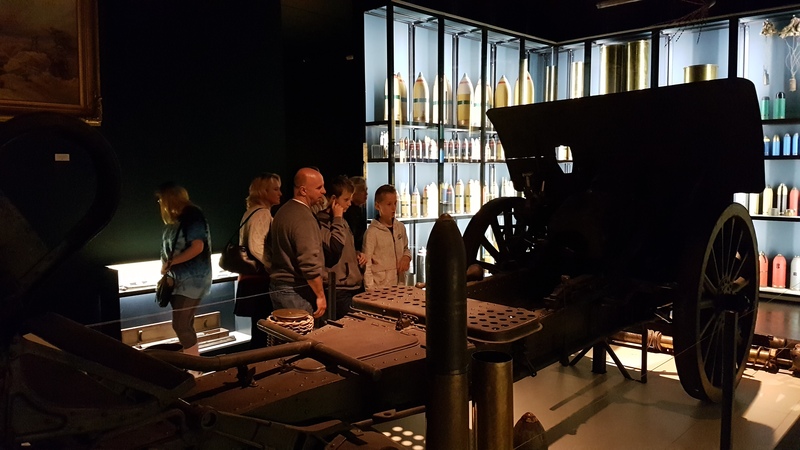 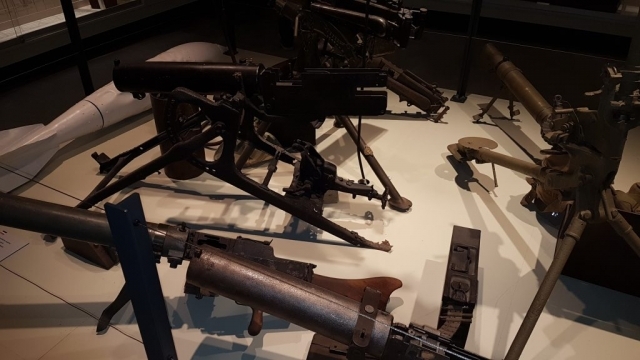 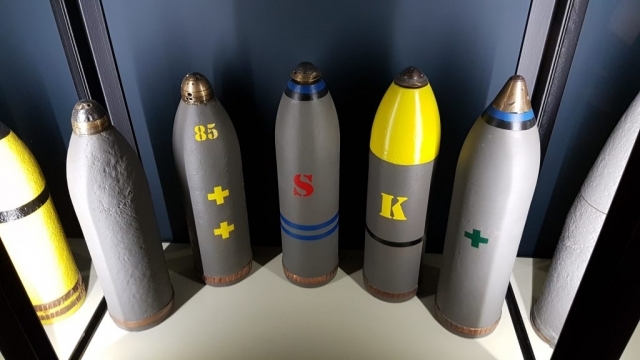 We made our way to the Passchendaele 1917 Memorial Museum to visit the well-regarded WWI museum and its model trenches to gain insights into the battle and its statistics. 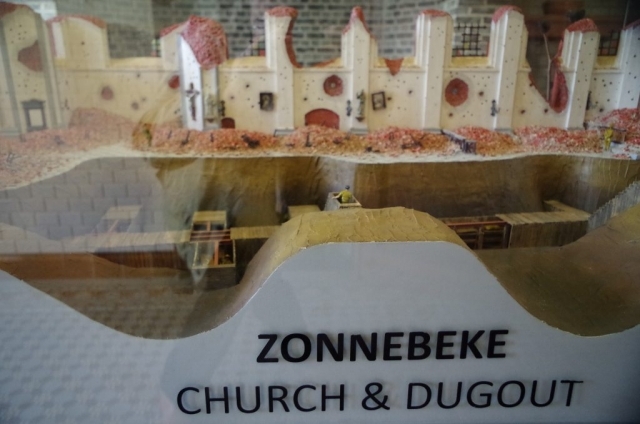 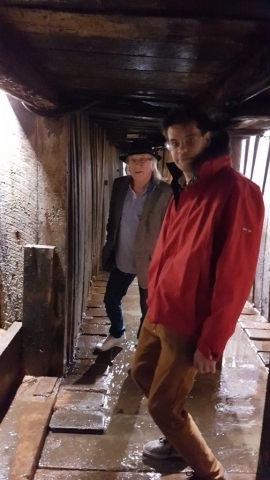 This was followed by a visit to a real dugout underneath the ruins of the nearby church at Zonnebeke, excavated over a period of 6 months approximately 5 metres under the old church foundations. 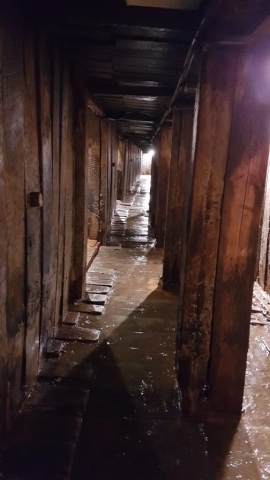 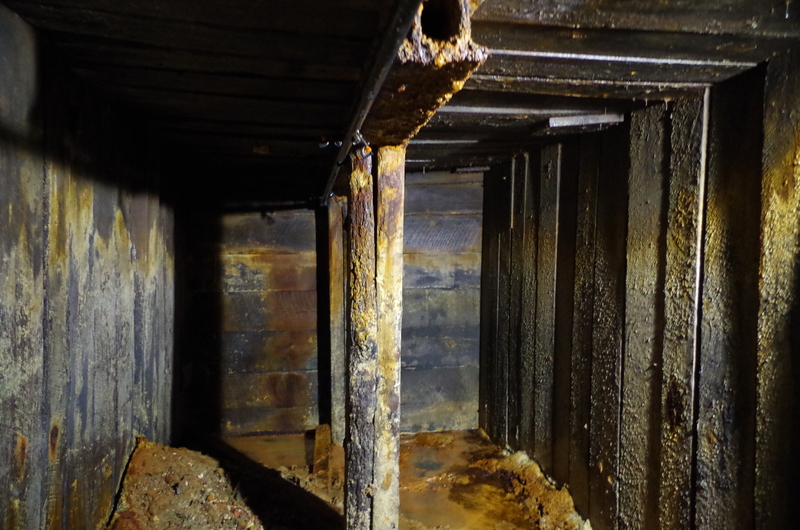 This was a unique opportunity as the dugout will be closed again by 11th November 2017 after which it will be refilled with groundwater for conservation purposes. 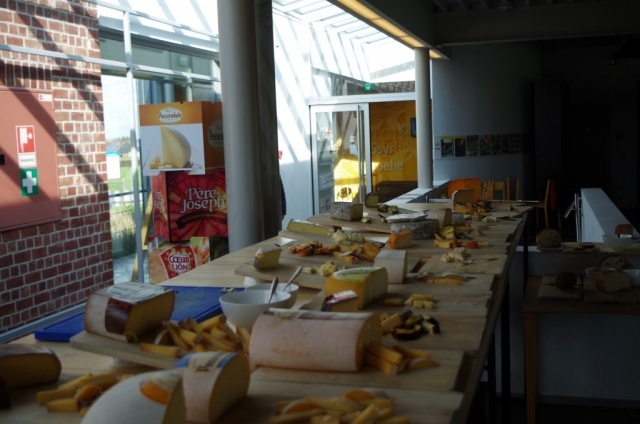 After the visit we left for the Passendale cheese factory for a late lunch. 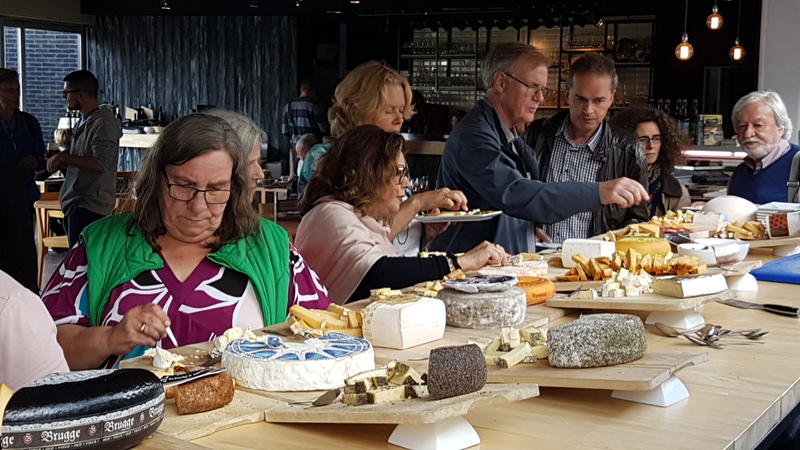 The cheese buffet was complimented by the beer of the same name brewed in memory of the battle and gave us an opportunity for the group to catch up with each other. 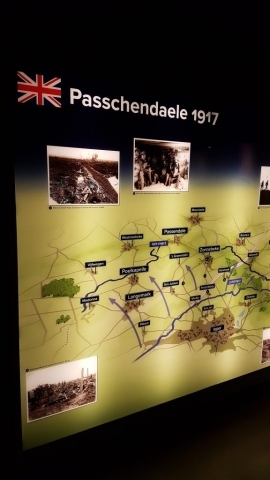 The entrance had an interesting exhibition of stories about the lives of some individual soldiers and another about the history of the family business. 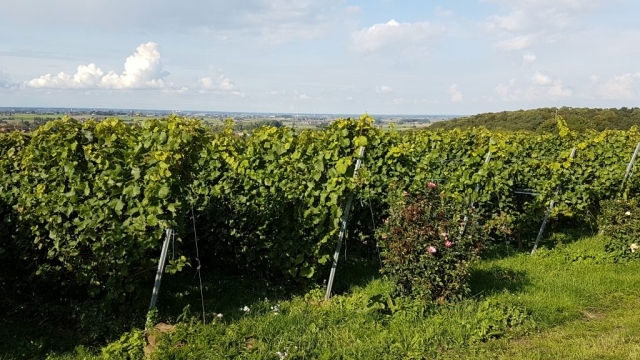 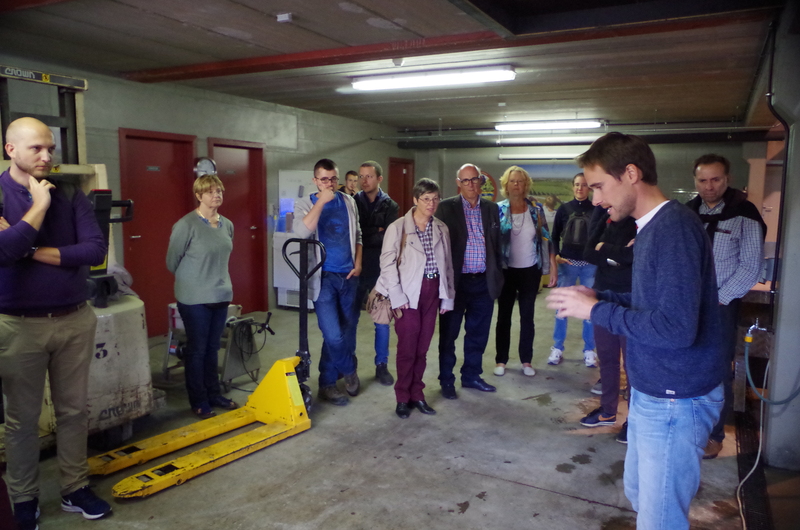 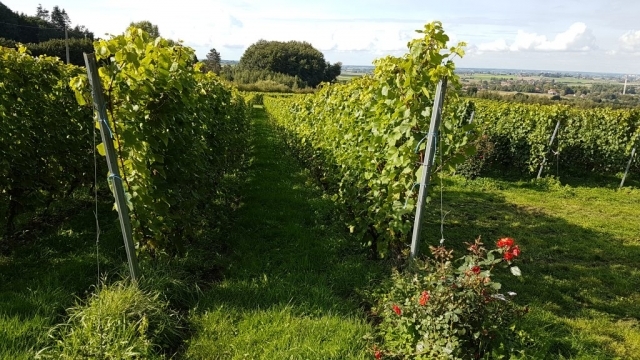 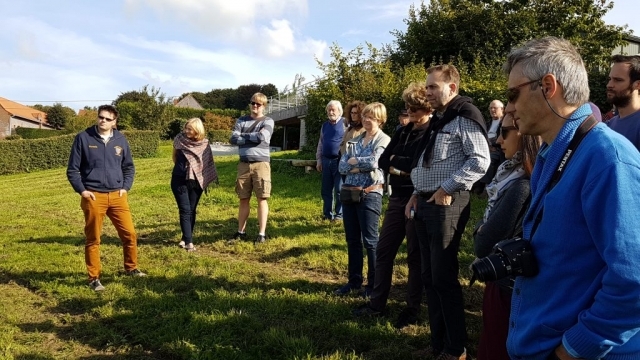 In the afternoon we made our way to the Belgian vineyard Entre-Deux-Monts in Westouter near the French border, between the Rodeberg and the Zwartberg (hence the name), for a harvest tour of the domain and a tasting of the EDM wines http://www.entre-deux-monts.be. We were hosted by owner Martin Bacquaert, who allowed us to taste the flagship sparkling wine Wiscoutre as well as the “méthode traditionelle” Bacquaert, followed by two still wines Pinot and the very first tasting of the 2016 vintage of the Chardonnay, another Cambridge exclusive. 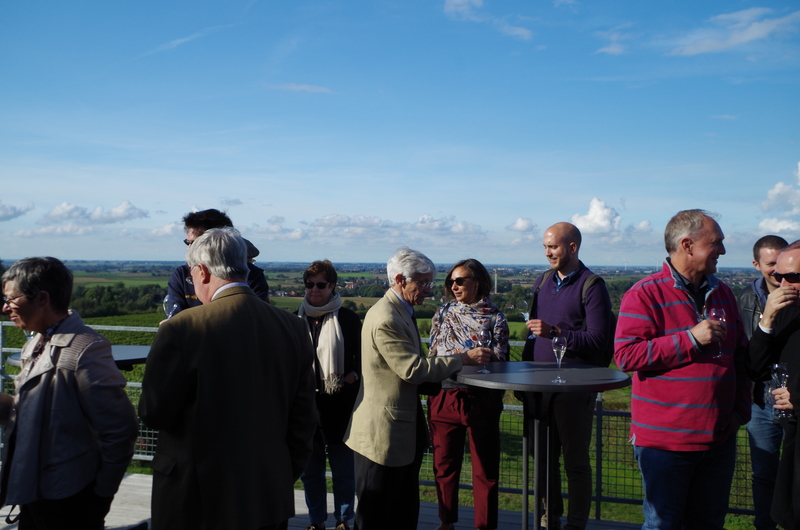 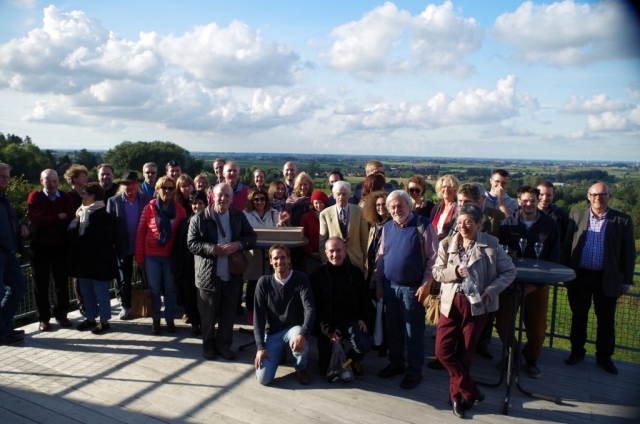 Basking in the sun, the view from the balcony terrace over the Flanders landscape only added to the enjoyment of the excellent wines, to the point we decided to take the group photograph there . 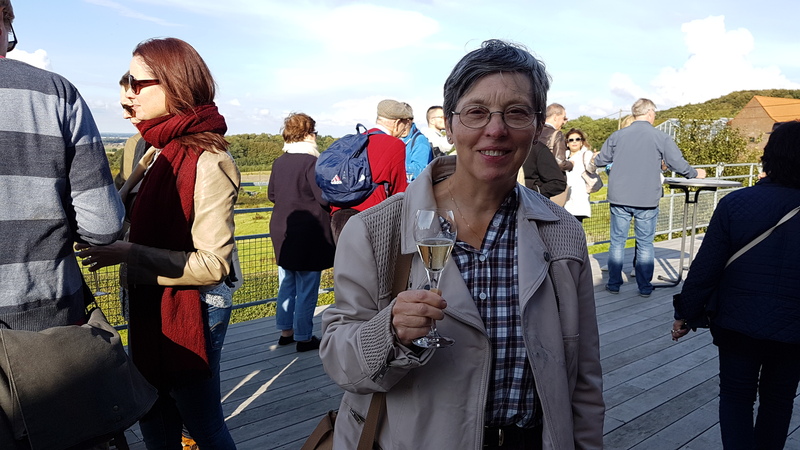 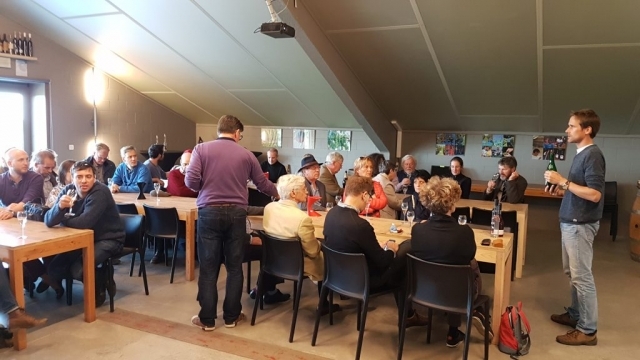 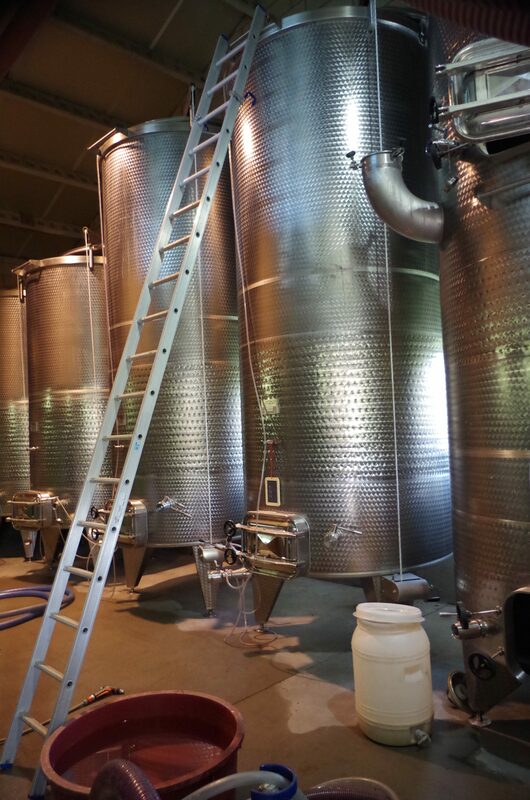 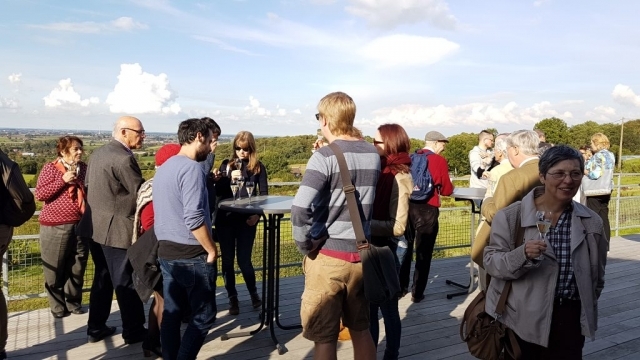 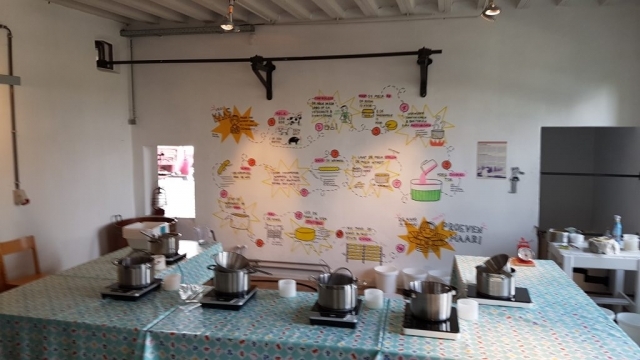 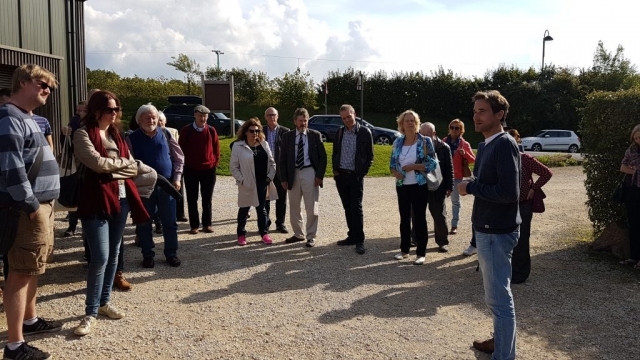 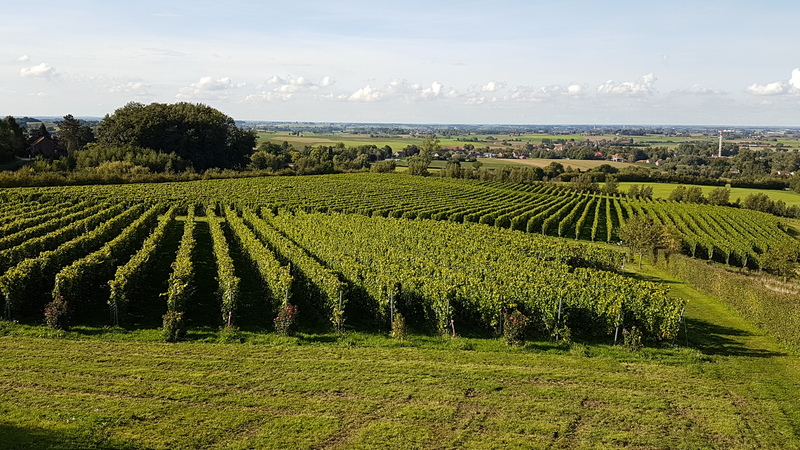 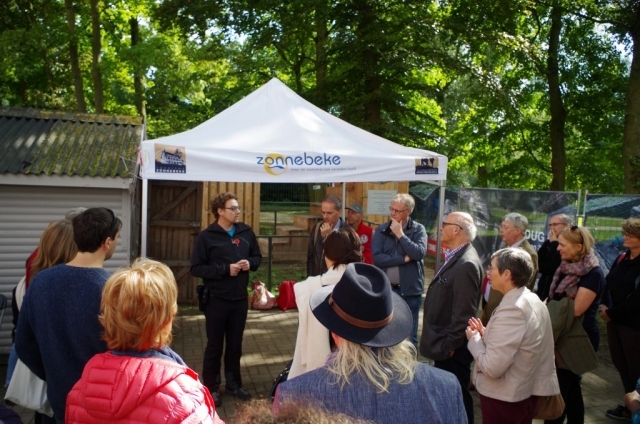 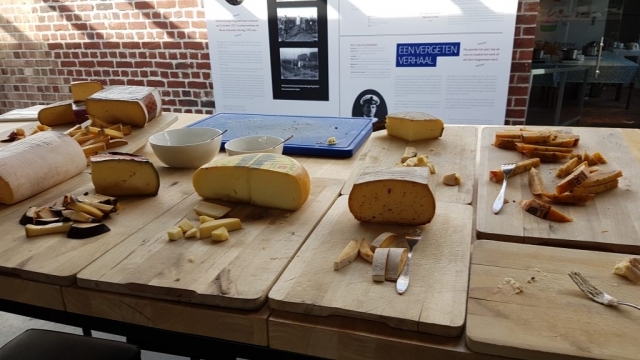 The members were pleasantly surprised at the quality of the wine that beer country Belgium has to offer in this beautiful yet well-hidden corner of Flanders, and ended firmly supporting the local wine industry, judging by the sales. 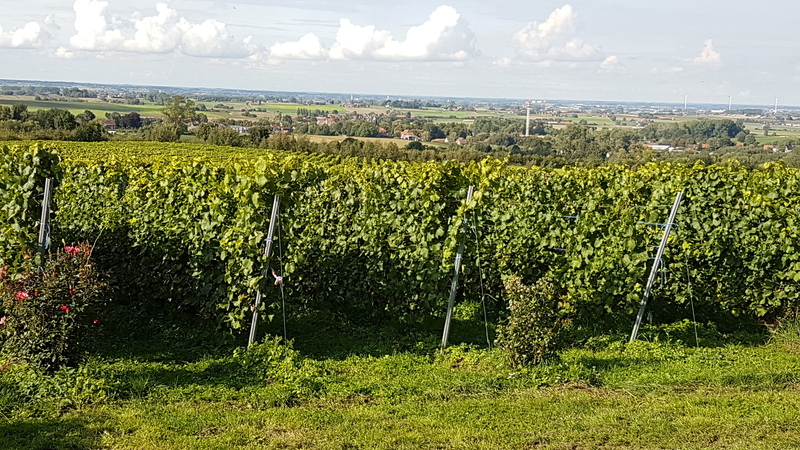 No wonder these EDM wines are well represented in Michelin Star restaurants in Belgium. 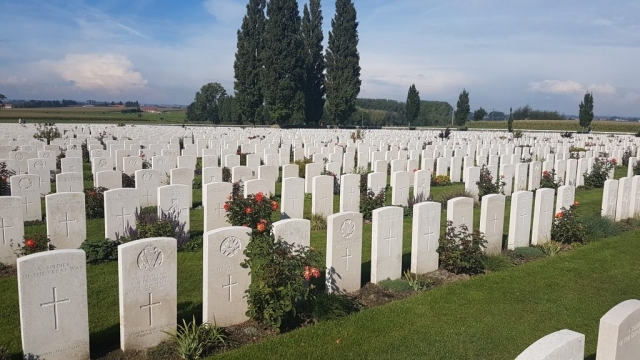 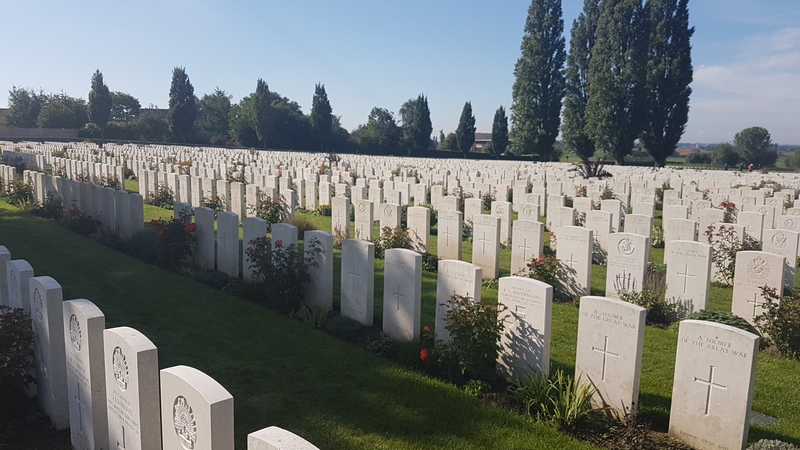 We moved on to Ypres as the early evening commenced, still bathed in sunlight, via the Kemmelberg, the renowned hill on the Flanders cycle tour, and the hills of Wijtschate called the ‘Messines Ridge’ with views to Ypres and to the west. Both destinations gave us a taste of how this once war-ravaged land has recovered to become one of the most beautiful parts of Belgium, full of culinary delights.Arriving in Ypres we observed the lions at the Menin Gate which had been lent back to the town for the centenary year by the Australian Government, who had been given them as a gift from the town as a gesture of friendship in 1936. The Australians had restored them at the national war memorial in Canberra. 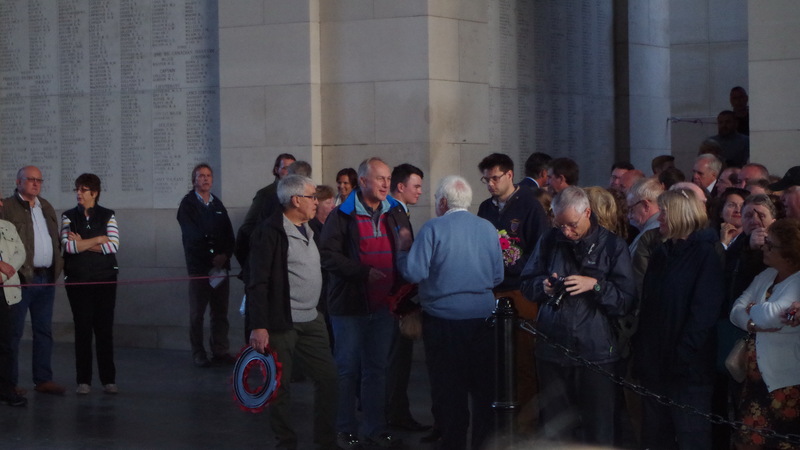 We had some free time to look around the cloth hall and belfry before The Last Post ceremony at the Menin Gate. 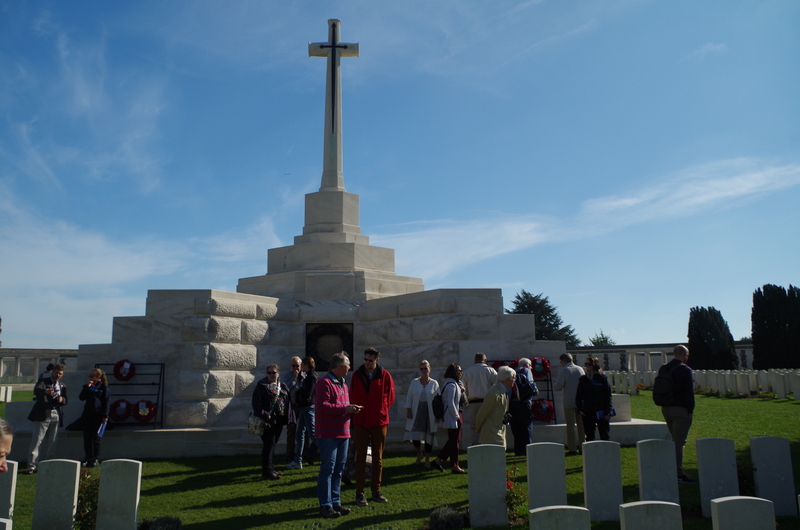 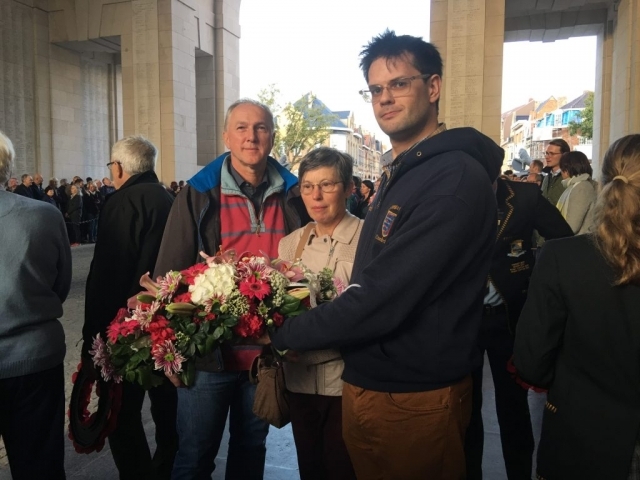 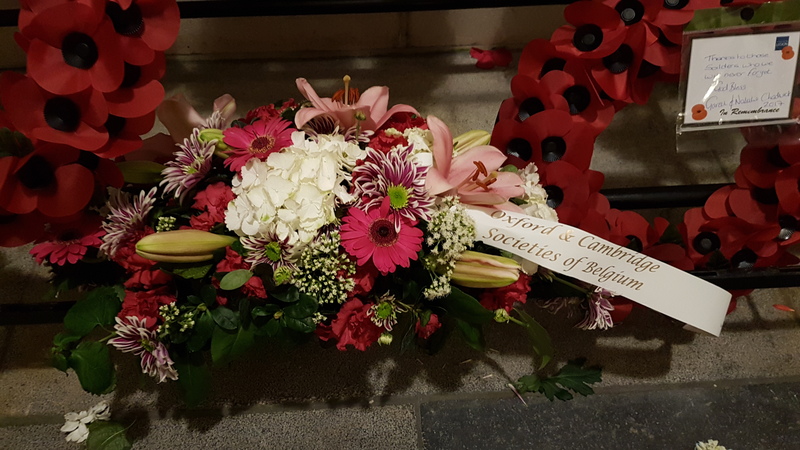 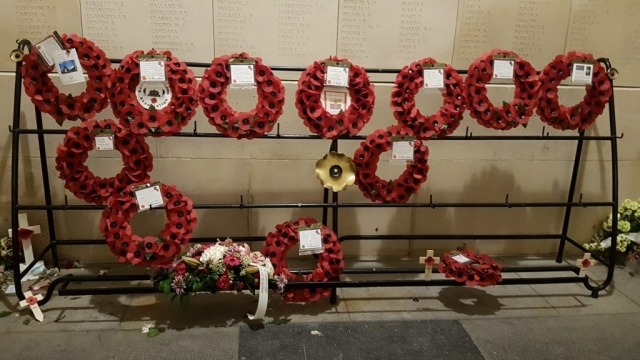 The well attended daily ceremony was very moving and was concluded by the laying of a wreath on behalf of the Oxford and Cambridge Societies, amongst others. 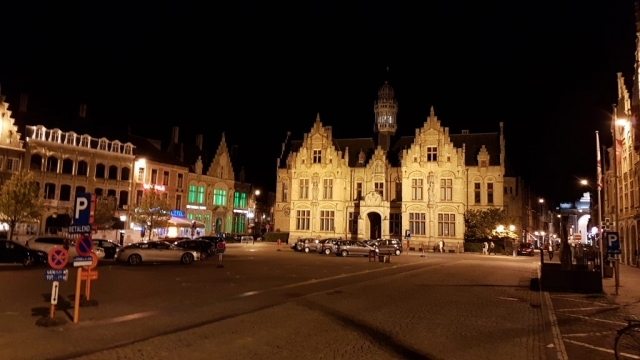 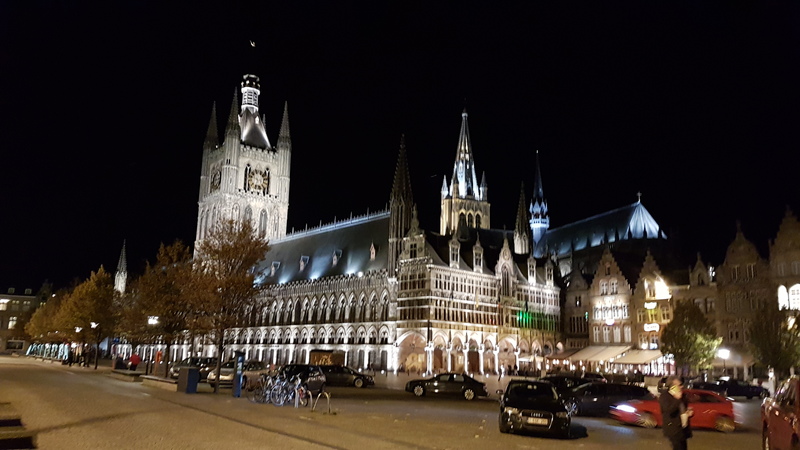 Before returning to Brussels, we enjoyed supper on the Ypres central square which, as the photographs in the hallway of the restaurant showed, had to be rebuilt completely. Finally a mention in dispatches for our organisers for a great day out, and preparing similar future trips in discovery of Belgium. 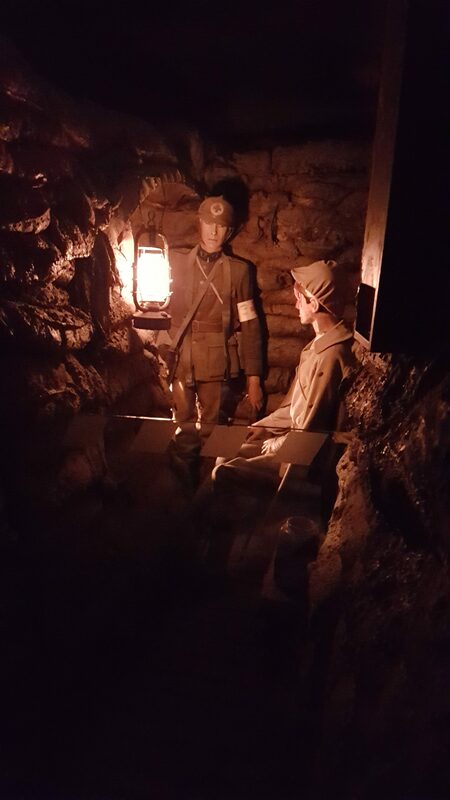 Suggestions are always welcome.